Sometime in 2001, Eberle & I convinced our good friend Judy Anderson (McCall-Donnelly High School drama teacher & all-around creative risk-taker), to have the MDHS drama troupe put on a production of Antigone for its winter 2001 play. Asking high school students to put themselves in a Greek tragedy was audacious, perhaps; the fact that we envisioned this production as incorporating dance & singing—as in the Greek theater—probably meant that the idea bordered on foolhardy. The fact that the play succeeded wonderfully was a credit, no doubt, to all our efforts, but especially to those of Judy as director & choreographer, & most especially to the cast of 30 students. With assistance & suggestions from both Eberle & Judy, I stitched the script together using the Dudley Fitts/Robert Fitzgerald & E.F. Watling translations (also consulting the Paul Roche translation), though I also re-translated the material in places, especially in the choral odes. A few changes were made to the play, as well, mostly with the hopes of improving accessibility for a contemporary audience. A short prologue taken from Sophocles' Oedipus at Colonus was added to give some background about the overall Oedipus story. Finally, we wanted to give a fuller sense of the girlhood the character Antigone is sacrificing when she is caught between reverence for heavenly law and the arrogance of the king. In order to do this, three poems by the early 20th Century poet H.D. (the pen-name for Hilda Doolittle) were added and set to music. Since H.D. was a keen student of Greek lyric verse, her voice was able to fit in with the general tone of the play. A Sappho fragment (Number 94, translated by Mary Barnard) was also added. 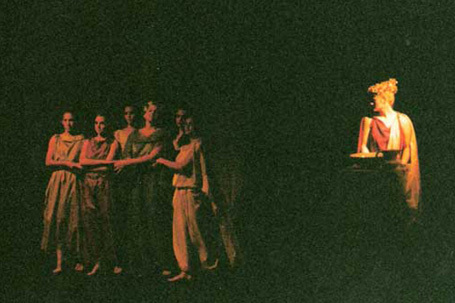 Antigone was performed December 6, 7, 8 2001 at the Alpine Playhouse in McCall, Idaho. Eberle composed almost all the music, though there was some input from the “Antigone Band” (soon to become the Alice in Wonder Band). Although the music for Antigone was much more “electric” & rock-oriented than anything we’d done before or have done since, Eberle was able to make it sound as if it came from another time & place, partly due to the odd time signatures (including 11/8 & 7/8). In addition to composing the score & directing the band, she also worked closely with the singers. Lauren Moore; Megan Barsness; Charlie Anderson; Kati Sheldon; Mary Beth Cope; Molly Shaver. Kati Sheldon went on to sing with the Alice in Wonder Band throughout 2002, & her performances of “Never more,” “Lethe” & “Crocuses” are taken from Alice in Wonder Band recordings, simply because the sound quality is significantly better; so our Alice in Wonder Band singer, Deadre Chase is singing harmony on the “Crocuses” recording. In the play, the harmony was sung by Lauren Moore, Lindsay King, Kat Sheldon, & Molly Shaver. Megan Barness sang the lead on “Crocuses” in the play, while Lauren Moore sang “Lethe.” Kati is also the soloist on “Where is the Equal of Love?” which comes from the actual play recording. It was crucial that the troupe contained so many talented singers—it was also crucial that virtually the entire troupe was able to move & dance well. These are skills Judy excels in teaching, but it was still unusual to have so many students who had talent in this direction. At the time Antigone was produced, Eberle & I had no recording equipment. We’ll always be very grateful to our good friend Audrey Bilger, who traveled up from the LA area (in December!) not just to see the play, but also to record it. 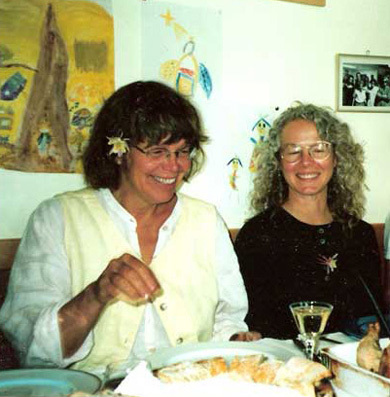 Audrey’s tape of the December 8, 2001 performance was transferred to digital by Audrey & her partner Cheryl Pawelski. Thanks again to you both!